If I say a word, will you promise not to leave? I know . . . I know . . . the first thing that comes to your mind ain’t kettlebell technique. You probably thought of a super bendy girl in tight leggings turning herself into a pretzel. Believe me; I’ve been there, too. But what if I told you practicing yoga the right way will improve your mobility? Practicing yoga, the right way, will improve your kettlebell technique. And if you practice yoga the right way, you’ll strengthen muscles previously unknown to you. I’ve developed a form of yoga called Functional Yoga Instruction. You don’t have to be flexible to benefit. It’s a movement-based system that reinforces neurological patterning vs. mindless flexibility. It’s not your typical woo-woo yoga. I’ll show you an awesome bodyweight flow to demonstrate. Before we get to that, may I share with you how I got here in the first place? In 2003, I was practicing Ashtanga Yoga ninety minutes a day, six days a week. I remember reading the only way to truly feel the benefit of yoga was to practice only yoga. So for about two years, I only practiced very advanced sequences containing tons of handstands, arm balances, and extreme back bends. On one end of the spectrum, my strength was going through the roof. Imagine a bodyweight routine with dozens of push-ups and handstands every day. On the other end of the spectrum, a curious thing happened: my wrists started to hurt, my shoulders were sore, my low back was killing me and my knees were achy. In my opinion, these were symptoms of muscular imbalance and repetitive stress syndrome. The thing that bummed me out was yoga was supposed to help me . . . not hurt me. I had a conversation with my teacher,Doug Swenson, about my yoga woes. And he had a very simple solution. “Lift weights,” he said. “Anytime my knees feel loose from too much yoga; I go for a hike. If I feel out of balance, I’ll use dumbbells. Especially rowing exercises to offset all of the pushing movements in yoga,” said Doug. A physical entity that must obey physical laws. No brainer, right? But there’s an unspoken rule in the world that yoga is safe because it’s yoga. Not true . . . unless you’re doing it right. I realized that the body’s physical function does not have anything to do with incense and chanting. It has everything to do with principles of anatomy and kinesiology. If we obey this law, we will get the result we want safely. If we disobey this law, although we may get the result we want, the risk of injury will increase significantly. In yoga, kettlebells, you name it, the law applies. I studied the way kettlebell lifters and other elite athletes moved. It has everything to do with correct alignment and proper movement patterns. I believe they are two of the most critical components of the human body’s function. Allow me to illustrate. An elite level kettlebell lifter can grind out or explode ballistic moves, repeatedly, without injury. But yoga students can strain their backs using only their body weight to manifest a yoga pose. Think about it. The kettlebell lifter is aligned correctly and utilizing optimal body mechanics to achieve an outcome; the yoga student is probably not. It’s because the kettlebell lifter understands that if they are misaligned and using abnormal muscle function, they will get injured. The yoga person may not be aware of these ideas because most yoga students are not taught to perform postures within the laws of optimal human body function. They’re usually encouraged to be as flexible as possible. I began to apply this new-found kettlebell wisdom to my yoga practice. Slowly but surely, I started to analyze all of the principles that go into each yoga pose. I would ask myself, “Which muscle affects this movement?” or “How can I create more stability here?” and before I knew it, my postures were much stronger. 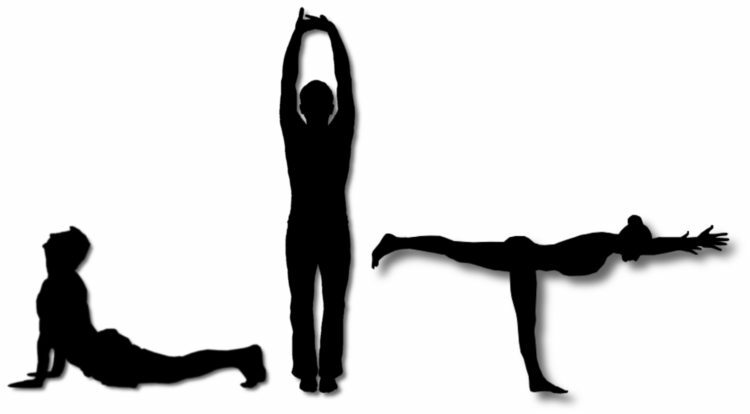 I also began to see similarities between yoga poses and kettlebell techniques. Mountain pose turned into a double kettlebell rack position. Half-forward bend was a hip hinge. High push-up position revealed itself to be a plank. And more. You’ll see for yourself in another minute. My body felt balanced from side to side and top to bottom, but best of all, my injuries began to slow down, reverse themselves and disappear. My yoga postures and my kettlebell technique were both improving big time. I believe this was happening because I was using Functional Yoga Instruction to practice my kettlebells. And I was using kettlebells to strengthen my yoga. I felt like Christopher Columbus. I knew I had to spread the word and start helping people move better and feel better. You’re going to use a classical sun salutation as your template. The big difference is that you’ll focus on your breathing and your technique instead of burning through it mindlessly. Wear something comfortable that allows you to move freely. Most guys wear board shorts and T-shirts. Most gals wear athletic tops and capris. Always practice barefoot. Do your best to breathe in and out through your nose at all times. And breathe diaphragmatically. If you want to be super technical, you can use a yoga mat. But it’s okay if you use any non-slick surface. Stand at attention with your feet about hip-width apart. Bring your hands to heart center in a prayer-like fashion. Pull your face back to wake up your neck extensors. Pull your shoulders down to wake up your lats. Protrude your chest—ever so slightly—to wake up your mid-trapezius. Tuck your pelvis under (posterior pelvic tilt) to get your abs and glutes going. Pull your kneecaps up into your groin to fire off the quads. Pull the floor apart with your feet—just a little—to wake up your legs. Hold everything together for five full breaths. Press your hands straight to the ceiling. Pull your face back to wake up the extensors. Exhale and bring your hands down, through the rack position and place the palms of your hands on your thighs. Inhale, soften your knees, keep your chest up and send your hips back. Stop when your palms find your kneecaps. Tighten up your lats and your spinal extensors. Come to a high push-up position. 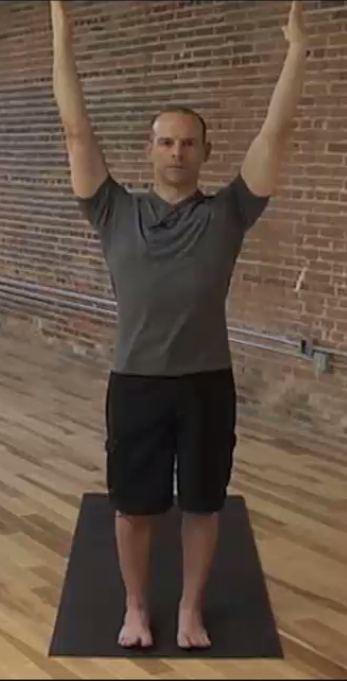 Pull your face back to stay connected to your upper body. Corkscrew your hands into the mat to pack your shoulders. Tuck your pelvis under (posterior pelvic tilt) and brace your abs. Fire off your glutes, your quads and tighten up. Follow Chip Conrad‘s cue by lowering yourself to the ground while only bending your elbows. The rest of your body should stay tight. Rest your forehead on the ground and extend your arms by your sides. Press down through your feet and legs. Think ‘Periscope’ from Mark Cheng. Peel your skull, shoulders, ribs and arms off the ground. Hold everything together for five full breaths then lower yourself back to the ground. From your belly, bring your hands under your shoulders. Push yourself to all fours. Push your hips up and back while you straighten your arms and legs. Bend your knees if you’re tight through the hamstrings and the low back. Hold this for five to ten full breaths. From downward dog, inhale and look between your thumbs. Exhale and shift your weight back and walk your hands to your knees. Let your palms find your kneecaps. Hold everything together for five full breaths then push through your feet to stand up. I know that yoga gets a bad rap. And a lot of people poo-poo it because they think they need to be flexible, wear a tunic and use essential oils. The truth is if you practice yoga correctly by applying a little physical science, you get huge returns in mobility, strength, pre-hab and rehab. Now you’ve got a bodyweight flow that’s going to help you improve your kettlebell technique. You’ll be able to concentrate on the details of each position (shoulders packed, abs braced, etc.) because you don’t have to worry about an iron ball dangling over your head. Make a commitment right now to give this sequence a try for the next two weeks. Use it as a warm-up, a cool down or as a daily reset. You’ll be in great company because respected experts such as Steve Maxwell, Tracy Reifkind and Dan John are all advocates of yoga. Pretty soon you’ll think of kettlebells as yoga with weights and you’ll think of yoga as kettlebells without kettlebells. Brian Friedman is the owner and director of Winter Garden Yoga, and is the author and creator of Functional Yoga Instruction. He studied yoga with Doug Swenson, David Swenson, David Williams, and Sri Dharm Mittra. He earned his HKC from Andrea DuCane and is formerly an FMS Level 1. You can experience the incredible benefits of Functional Yoga Instruction with Brian’s highly acclaimed digital downloads.